This country house is set over the two floors and has great views to the back over the countryside. On the ground floor there is a large open space which could be turned into more living space such as an open space kitchen diner. On the upper floor there are two bedrooms, a kitchen, pantry and a living room. Most of the floors and ceilings still have the original wooden beams so maybe changing these to concrete or replacing them with a sturdier and more eye catching wood if your idea is to leave them on show. Downstairs is one big open space and has had some work carried out such as concrete pillars and some rendering has been carried out. This space with some patio doors leading out onto the garden and more windows, making the most of the natural light, would be perfect as a large open space kitchen diner. Meaning that the upstairs could be kept as just bedrooms and a bathroom. Outside there is plenty of land, 5760 to be precise. The land has various fruit trees, grassy parts that could be used as garden and a large vineyard. On the land there is a borehole and a water storage tank. 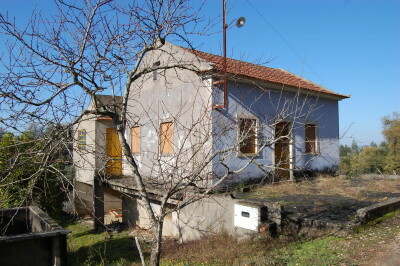 The property is situated in the village of Portela de Vila Verde, Areias. Areias has various vafés, a nursery and primary school as well a lovely church. There is a weekly market here where you can buy all sorts of fresh and local produce. The larger town of Ferreira do Zêzere is only around 9km away from the property. The town of Tomar is around 15km away from the property. Tomar, which is home to the UNESCO listed Convento do Cristo, is a bustling market town with a variety of supermarkets, shops, cafes, restaurants, bars, banks, health centres, hospitals, schools, bus and train station and university. The property is also only a short drive from Castelo do Bode Lake, which is popular for all kinds of water sport activities.